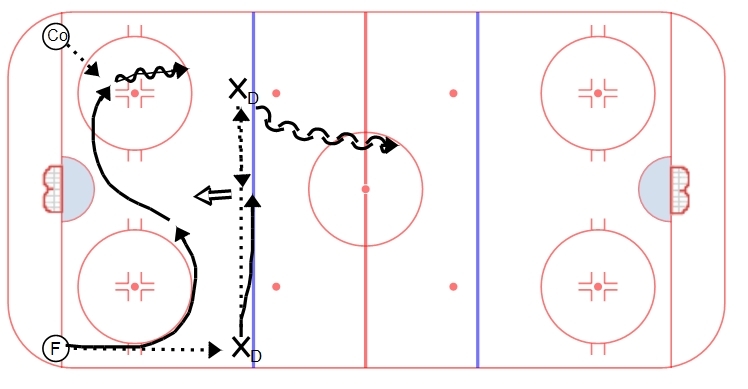 This week’s drill is a shooting drill into a full ice 1v1. It is run out of both ends simultaneously. The drill starts with the Forward passing the puck from the goal line to a Defenseman waiting at the blue line. A second D is waiting in the middle of the ice. The puck moves D to D while the F comes up around the circle into the mid slot area. The mid-D walks the puck while the board D sprints to the middle. The puck moves D to D again for a shot with the F in front for a tip or screen. Coach in the corner then gives a puck to the F who attacks the D who started in the middle of the ice. This is a full ice 1v1 that is played out until a whistle. On the whistle, the next group goes. Forwards work on protecting the puck on the rush, using their speed to beat the defensemen and being creative in a 1v1 situation. They should look to try to take advantage of D who cross over or attack the open triangle. Defensemen need to have quick feet, avoiding crossovers and maintaining a good defensive stick. Gaps are critical – you can require the D to wait until the defensive blue line to attack the puck carrier.